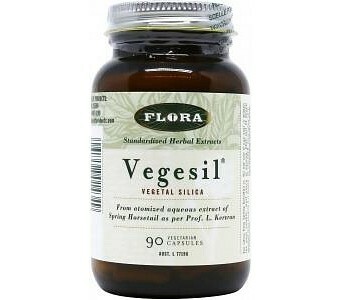 Slow the signs of aging with the Vegesil Vegetable Silica from Flora. Sourced from spring horsetail plants which contain the highest percentage of Silica that can easily be absorbed by the body and improves skin elasticity. Aqueous extract of Spring Horsetail Healthy hair, skin, and nails Dietary Supplement Directions: Take 1 capsule up to 3 times daily with meals. Store in a cool, dry place.